I received a book on review recently. The title: Secrets of an Organized Mom. Let me tell you, this book, written by Barbara Reich, has been the inspiration and guidance I have been looking for. Without having even fully implemented Barbara’s strategy, I have sorted closets, organized play spaces, and reclaimed drawers and cupboards. Right from the first page, Barbara had my attention. And not just because being organized and staying on top of the stuff that families accumulate is every mother’s dream. But because, she gets it. She’s a mom herself, which of course gives her that inner understanding of what other moms are struggling with. In Secrets of an Organized Mom, the process is broken down into four simple steps followed by the 10 commandments of organizing. Now, any organized person will tell you that these steps and commandments are the basics of keeping on top of things. And I’ve seen the general idea laid out before, but there is something special, witty, humorous, and understanding in the way that Barbara tackles this topic. I think what shows through is her passion for organizing and her passion for happy families. This is what captured me. And I can think of a few people in my life to whom I may be gifting this book. I think they’ll be captured by it in the same way that I was. Now, onto the organizing. Even without scheduling time in my calendar (something Barbara outlines as necessary to properly tackling a “hot spot” or “the area that drives you absolutely the craziest”) and fulling implementing her methods, I have been inspired by her book to get organized. In several areas of my home, I have Purged (step 1), Organized (step 3) (I skipped Step 2—Design because I already had infrastructure in place, we just weren’t using it) and Maintained (step 4). And I have felt great doing it! Less clutter = a clearer mind. My next step is to schedule some time for that hot spot that’s driving me mad! Got a mess in your home? Want to dig out from under it? This is the book you need. Funny, easy to read, lots of great information and inspiration. 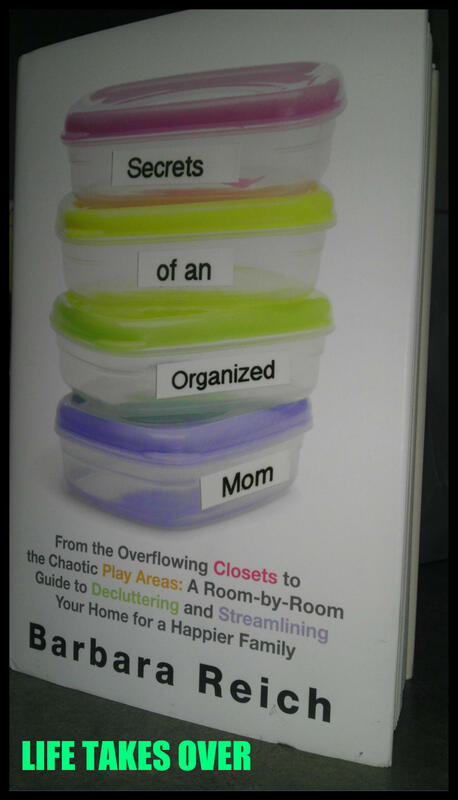 Secrets of an Organized Mom is by far the best book I have read on organizing and staying organized. The book is available in all major book stores and online at Amazon.com. There is also an ebook version available. For more information about the book, visit www.SecretsofanOrganizedMom.com. I received a copy of Secrets of an Organized Mom for review. However, the views and opinions stated above are my own. I was not compensated in any other way. This entry was posted in Uncategorized and tagged Betterment, clutter, Family, happy families, kids, Motherhood, organizing, Reviews & plugs, stuff on March 5, 2013 by Nancy. Oh my gosh, my whole house is a hot spot! Sometimes I think it would be easier to torch it and start anew but living in a tent while our house gets rebuild would be no fun either. I may have to check this book out (I will see if the library has it) and maybe it can help me get my house under control. I know what you mean. When I started reading the book, all I could think was, “how am I supposed to pick a hot spot if my whole house is a hot spot? !” But the author even gives tips and insight on how to do that! I highly recommend it. I put the book on hold at the library but the book must be good because there are seven other holds on it before me! 🙂 I am looking forward to getting rid of my hot spot house. Good for you. Sounds like you are on a roll!